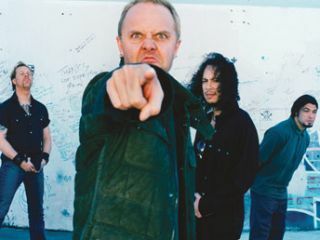 Lars Ulrich has revealed that Metallica chose Greg Fidelman to engineer Death Magnetic because of his previous work on Slipknot's third album. Death Magnetic has caused controversy with some Metallica fans, who have complained about excessive clipping on the CD mix. Even the mastering engineer Ted Jensen has blamed 'brick-walling' at the mixing stage for making his job difficult: "Believe me, I'm not proud to be associated with this one", Jensen wrote in an email quoted by a Metallica fan forum. Read the backstory, and how Death Magnetic arguably sounds better in the Guitar Hero version. Now, in an interview with Rhythm magazine, Metallica drummer Lars Ulrich reveals that the band chose the mix engineer for Death Magnetic after being impressed with Slipknot's third album. "Rick (Rubin, producer) sat down with us and said: 'Who do you wanna work with? And we said, 'We want to work with the guy that did the Slipknot record (2004's Volume 3: The Subliminal Verses)'. And that guy was Greg Fidelman. "So he did most of the day-to-day work and most of the drum sounds. Rick doesn't like things to be too ambient. He doesn't like things to be too 'verbed out." Fidelman's certainly a well-travelled engineer. He's previously worked on Audioslave's debut album, on U2's U218 singles compilation, and engineered Red Chili Peppers' Californication. Though it's interesting that Californication was also criticised for being part of the so-called loudness war, for the same reasons as Death Magnetic. In the October 2008 issue of Rhythm there are also interviews with Rick Allen, Terry Bozzio, Steve White and more. Go to Rhythm's blog page.